Has proved to be trouble free, easy to operate, quick and convenient. Definitely the best purchase I have made. Here is a couple of photo’s of my Boat Loader. It works really well. No more lifting is the best part of it and the Sea Jay fits perfectly. I thought I would be able to to lift the boat on the roof rack forever – done it for 10 years! 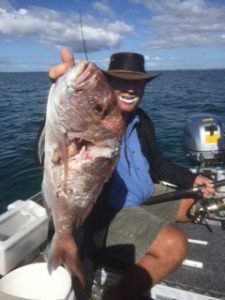 70 now and as many others at Warra station at Ningaloo Reef I have invested in a custom boat loader the best thing I ever done. We purchased about February 2015 and since then taken the dinghy Mako 371 to Coral Bay, Onslow, and Monkey Mia in WA. 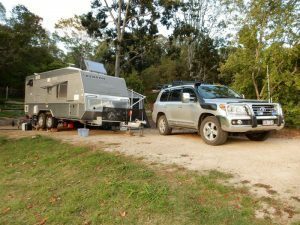 We are now travelling Australia and have been on the road since October 2015. 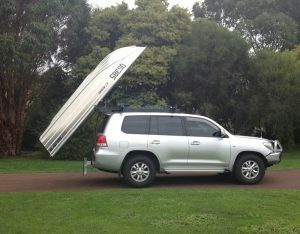 This is so far over 6000 km with the boat on and towing 23 ft caravan. We had a minor problem breaking a rear black slider pad and dirt under the motor brushes. 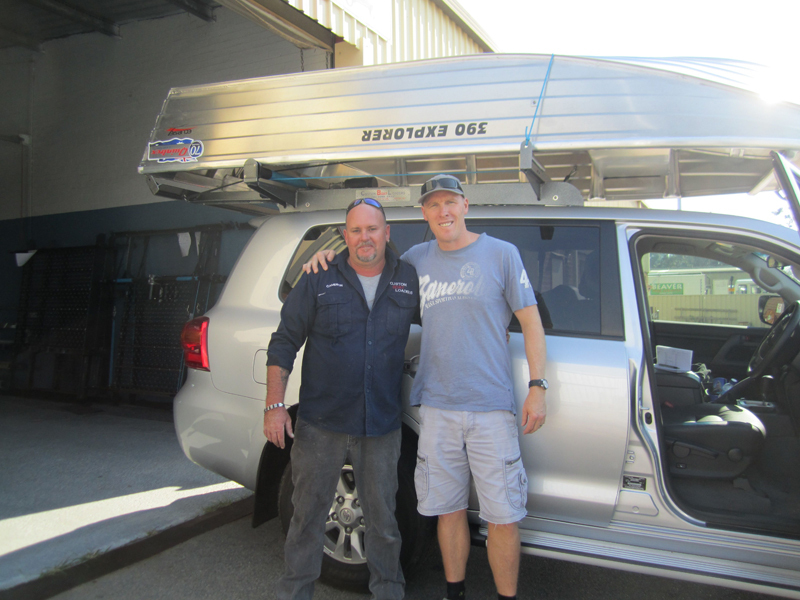 Phoned Cameron and technical assistance was fantastic and parts sent and received in two days at Yarrawonga Vic. Great prompt service was much appreciated. I estimate we have taken the boat off the loader more than 50 times It becomes an attraction wherever we stop and use. I am sure our positive comments have brought clients to you. If we can assist please feel free to contact at any time. 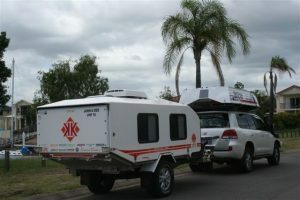 Have provided some images of our Custom Boat Loader with caravan in tow at a campsite in Lake Tinaroo Dam North Queensland last year, unfortunately, we didn’t take any snaps of loading or unloading, we find the Boat Loader is very easy to use in both undertakings.. On that occasion, we spoke to other owners of your Custom Boat Loader including several other persons who took photos and details of your product for future contact as well . Several of those people actually came from W A. Due to height constraints of our garage entry, it is necessary to remove and store the boat loader when not required. 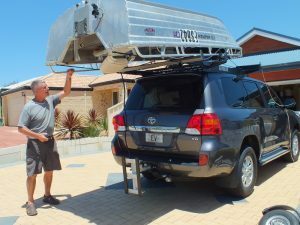 We leave the angle brackets attached to the vehicle permanently and it is an easy task to lift this lightweight loader onto the roof brackets and into position. 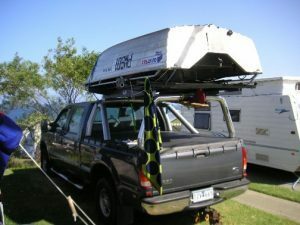 We have seen many variations of boat loaders in use but in our opinion, none equal your Custom Boat Loader. Attached are few photos of boat loader in use just yesterday. Cheers David. I absolutely love my Custom Boat Loader! 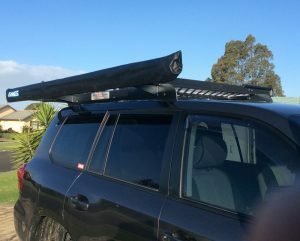 It was relatively easy to install and great to use. I always seem to draw a crowd whenever I use it! Thank you for making boating easier!! My friend (has your Custom Loader on a Dodge Ram) came up yesterday. 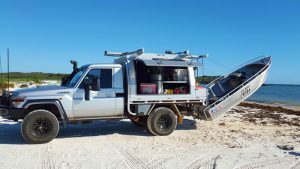 We fitted the loader to my Cruiser in 2.5 hours. It worked a treat first time and my wife operated it with ease. As a (retired) Engineer I think the design and operation is brilliant. And a very well made product. I think we are going to be the envy of many who see us unload side by side when we go away up North next winter. Congratulations on such a good product – I wish you every continuing success in the business. 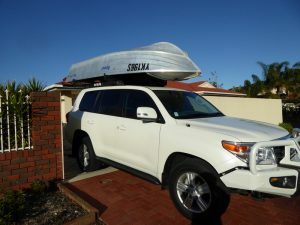 Di, Hi there – thought I would email you some photos of our rig now that we are set up with our 200 series Sahara – no stopping us now – the Custom Boat Loader is worth every cent we paid for it – no more back breaking, lifting and arguments between us when he says to me – “lift more – lift higher etc”. 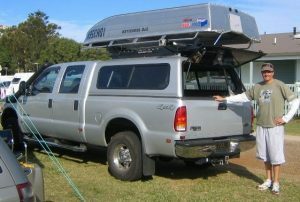 Hi guys, Here’s a few pictures of the boat loader on my F250. 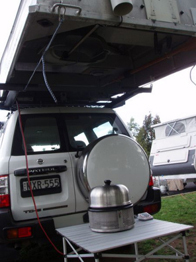 It worked fantasticly on our 3 week trip. Hi All, When it starts raining simply roll back the boat and start cooking under the shelter with my favorite cooker the Cobb. Life can’t get any better. 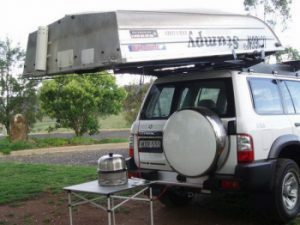 When you finished cooking back your car up to the waters edge let the boat loader do all the work by lowering your tinnie to the water. Now its time to go fishing. Former West Coast Eagle, Ashley MacIntosh with Cameron – very happy with his new loader.